DYF Teachers Ellen Osten, Maggie Peter, Rebecca Schuler and Errin Odell work with Instructor Lonny Grafman to size a micro hydro system. 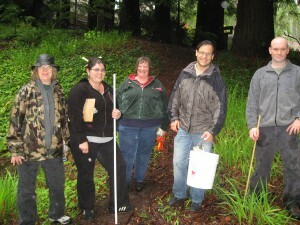 The first DYF Teacher Institute follow up occurred on May 2, 2009 from 8am- 4pm at Humboldt State University. Links to the materials provided at the institute are available below. Five DYF teachers attended Ellen Osten, Maggie Peter, Rebecca Schuler, Errin Odell and Forrest Stamper. 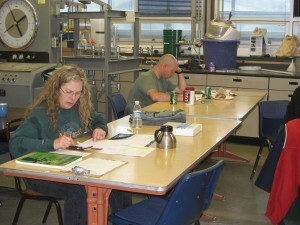 The instructors were Lonny Grafman and Beth Eschenbach of the Environmental Resources Engineering at HSU. In the morning Beth Eschenbach reviewed the importance of increasing the number of students interested in studying STEM (Science Technology Engineering and Mathematics). Forrest Stamper and Beth Eschenbach rreflected on the successes and challenges of teaching ENGR 215 Introduction to Design at Hoopa Valley High School. (Efforts to Increase STEM in California and ENGR 215 at Hoopa Valley High School ). Other DYF teachers reported on how their teaching had changed since the DYF institute last summer. For instance, Maggie Peters brought her basket work and discussed how she teaches math, science and engineering in a culturally relevant way at Hoopa Valley Elementary School. Errin Odell shared his experiences with building bridges with manilla envelopes and using the West Point Bridge Software at Fortuna Union High School. After the assessment, Lonny Grafman provided background information on micro hydro design, physics and math. (Microhydro basics ). The teachers learned how to use the equation below . After lunch Lonny Grafman led the participants into the HSU forest along Jacoby Creek. 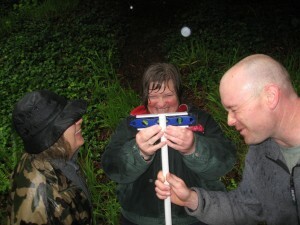 The teacher participants learned how to determine the potential head in a hydro system, using simple tools such as a measureing tape, a 5 foot pipe and a level. Ellen Osten and Errin Odell calculate head loss due to pipe friction. After returning the the lab, the teachers discussed how they could use this lab in their own classrooms and completed a post assessment. Each participant went home with a set of materials so they could complete the lab with approximately 24 students. Ellen Osten, Becca Schuler and Errin Odell demonstrate the use of a level for simple surveying. Lonny make the BEST vegan marshmallow taffy in the world. Thanks! It was my first time.